Earth Day was officially celebrated April 22, but you can instill Earth-friendly practices and products in your home any time. Whether it’s new products made with sustainable materials or furniture and accessories created from recycled or salvaged items, why not think ‘green’ when decorating your home? 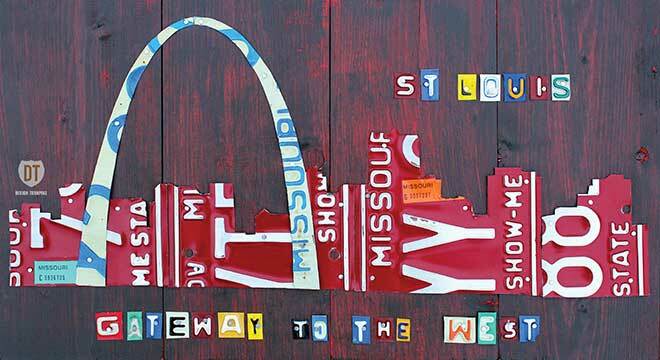 Artist Dave Bowman creates handmade wall art and maps using vintage license plates and reclaimed wood. This St. Louis skyline piece (pictured above) is from his Skylines collection and is available at designturnpike.com. San Diego-based Bottles & Wood repurposes old beer, wine, liquor and soda bottles into glassware, serving pieces, jewelry and décor. 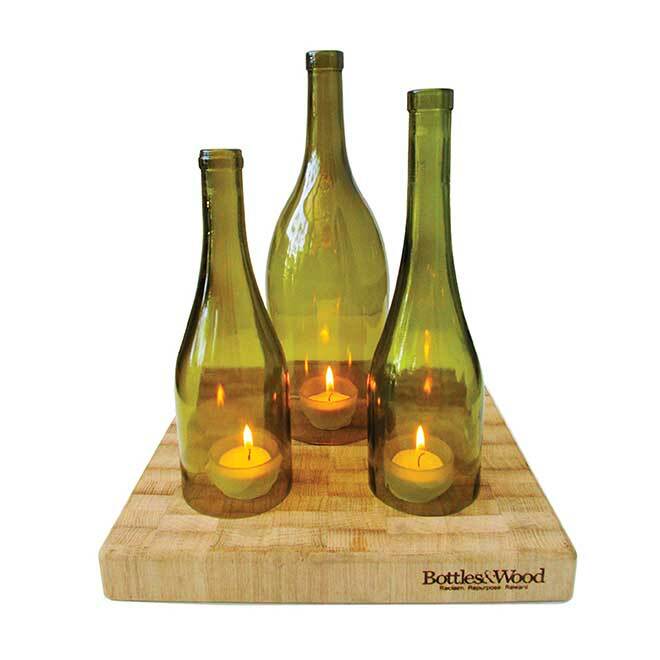 Shown here is the recycled wine bottle hurricane trio. Carlisle Wide Plank Floors offers a range of reclaimed hardwood flooring handcrafted in the U.S., including Chestnut, Heart Pine, Oak, ‘Grandpa’s Floor’ and Milled Barnwood (pictured). 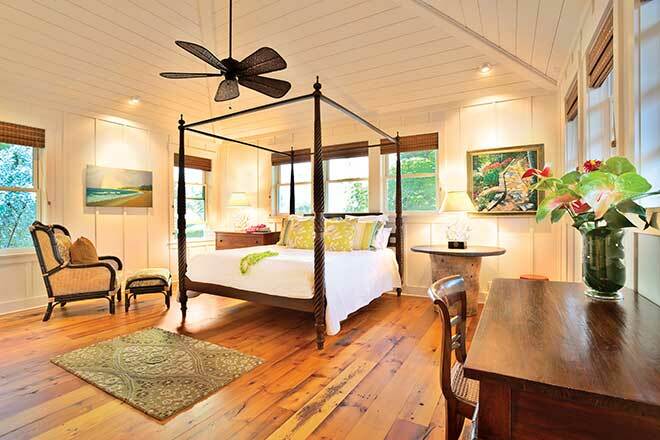 Each plank is a true antique, refinished by Carlisle craftsmen. Orders include a complete history of the wood, such as the region and building from which it was procured. 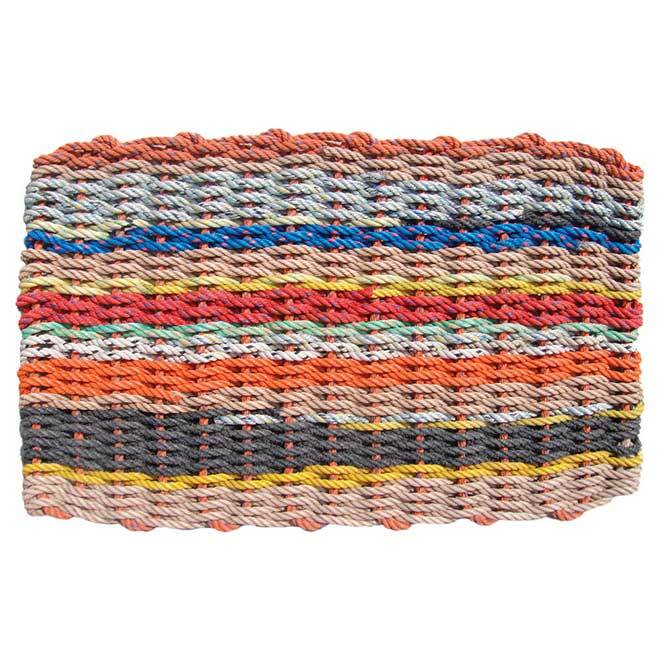 These colorful, weather-resistant doormats are woven from float rope that once tethered lobster traps in Maine. Fishermen switched to heavier sink rope to protect the Northern Right Whale, which often became ensnared in the floating rope. Tons of float rope was slated for landfills until The New England Trading Company began weaving it into doormats. 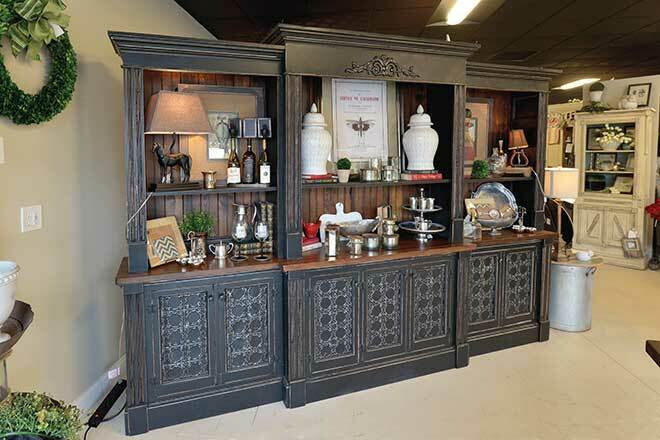 Hannibal, Missouri, native Michael Moore crafts unique home furnishings using mostly reclaimed lumber and architectural salvage from old houses and buildings that are being destroyed, such as this incredible step-back entertainment unit made of antique molding and vintage ceiling tin, available locally at Marketplace at the Abbey. 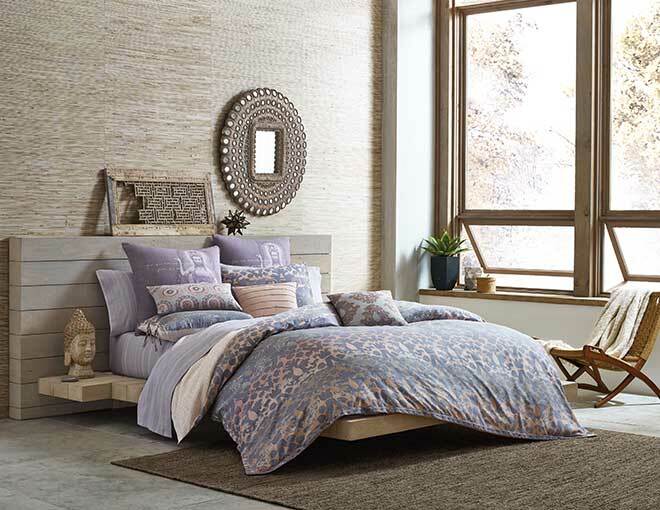 Go green in the bedroom with certified organic bedding sets. A new line by Under the Canopy is now available at all Bed, Bath & Beyond locations in soft, ethereal patterns such as ‘Goddess,’ shown here. Each set includes a comforter, shams and decorative throw pillows, all filled in the U.S. and made of soft, recycled fiber. 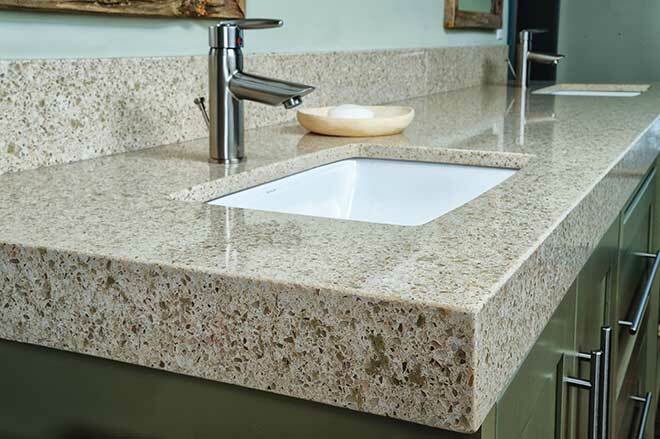 ECO by Cosentino is a stylishly sustainable surface manufactured from 75 percent recycled materials, including mirror, glass, porcelain, earthenware and vitrified ash. Even 94 percent of the water used in its manufacturing process is re-used. Shown here in Forest Snow. You’ve likely used LED lights, but OLED is the next generation of energy-efficient lighting that provides beautiful, natural light by passing electricity through a thin layer of carbon-based organic dyes. 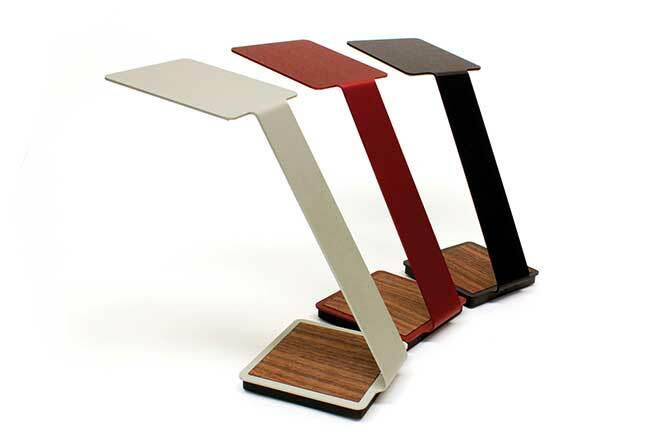 The Aerelight is a sleek, modern, OLED task lamp that uses 80 percent less energy than a traditional 60W bulb at maximum brightness and is crafted from sustainable materials.